Over the past couple of days I have completed several media interviews about the AIR MILES Expiry rule and how miles will begin expiring at the end of this year. This was all prompted by a CBC article that came out last week and follows up on the news we broke back in December of 2011 of the AIR MILES Expiry changes and more. Fast forward to today where, even though we are only in March it may be time to start thinking about those miles you may lose. 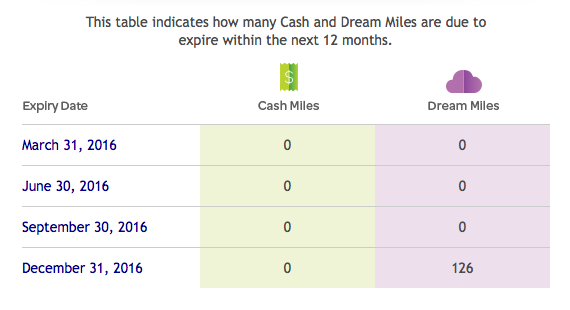 First off, you need to find out how many miles are set to expire on December 31st. Remember, AIR MILES technically has two expiry rules. The first is the inactivity rule which is that if you don't earn or burn at least 1 mile in your account within a 24 month period you'll lose your miles and the 5 year date stamp rule where miles expiry no matter what after 5 years. As you can see I will have 126 miles expiring. Not a huge amount but still something for me to think about. Now, I know there are some of you who have been collecting since 1992 like I have but have never redeemed, so you'll have a lot of miles that you stand to lose! Please oh please find a redemption for them. If it is travel, don't worry you don't have to travel this year, as long as you book by December 31st you can travel well into 2017! If travel isn't an option, go for gift cards, merchandise whatever, just don't lose those miles for absolutely nothing. You are better off with something than nothing! 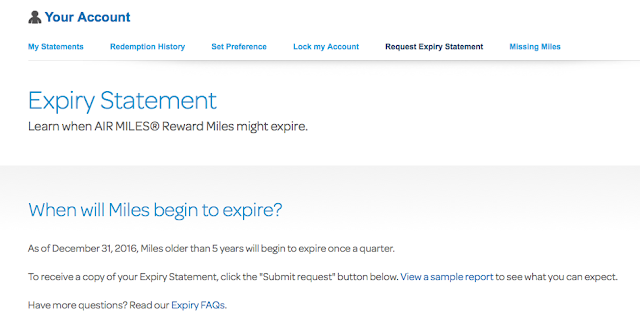 After December 31st, miles will expiry quarterly from the quarter they were earned in 5 years prior, so you will always have to stay on top of your account and really keep an eye on those miles. 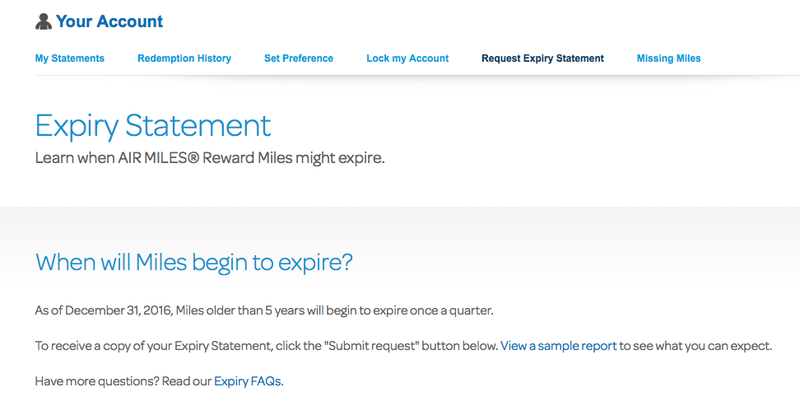 Request the Expiry Statement often so that you know what miles are about to expire. Ultimately I wish AIR MILES would have chosen to follow in Aeroplan's footsteps and gotten rid of the 'date stamp' feature on miles but they haven't. The thing is they still have time so maybe, just maybe that will happen. Not keeping my fingers crossed however. As a comparison, WestJet Rewards dollars also have a five year date stamp and some of those will be coming up for expiry in the next few years. I would like all of our readers to go and get your mileage expiry statements, screenshot them and post it in the comments below. We can all then all work together to help with what redemptions you should think about if you don't have any ideas yet. Let us know with your screenshot if you are at a loss as to what to do or on the other hand let us know what you are planning to do with them! Also as part of the challenge let's try to see who has the most miles expiring! I know I won't win that one! • Enjoy a special 0% introductory interest rate on transferred balances in the first 6 months if you choose to transfer your other credit card balances to this American Express card at time of online application. A 1% balance transfer fee will be charged on the transaction amount and interest is payable on the amount of this fee at the applicable rate for purchase.